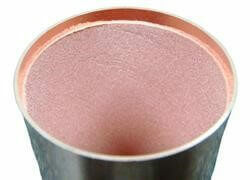 The manufacturing process of heat pipes and vapor chambers begins with a metal tube or stamped sheet to which copper powder (pictured) or mesh is attached to the inside wall. This material forms a capillary wicking structure through which liquid can move once the device is complete. In the case of vapor chambers, vertical posts or specialty designed internal spacers are then added for improved vapor flow and structural rigidity. A small amount of a working fluid is then added to the device which is then vacuum sealed. Both the wicking structure (sintered powder, mesh, grooves) and the liquid (water, ammonia, nitrogen) can be changed to alter the thermal transport characteristics of the device. A completed two-phase cooling module includes one or more heat pipes and/or vapor chambers, a fin stack to dissipate heat into the surrounding air, and a mechanical method off connecting the heat sink to the heat source. When heat is applied to the two-phase device (evaporator), as seen in the above figure, the liquid near the heat source will vaporize, increasing the vapor pressure. This localized increase in pressure causes the vapor to flow to lower pressure regions of the device (toward the condenser). This process can be likened to the full absorption of water into a sponge when only its corner is dipped in water. While gravity plays some role in this cycle, the natural capillary action of the wick (sintered metal, mesh, or grooves) is responsible for most of the liquid movement. Both types of two-phase devices use identical wick structures to enable the transport liquid from the condenser section of the heat sink to the evaporator section. Each has its own cost and performance characteristics. The most common wick structure is a sintered wick type because it offers the highest degree of versatility in terms of power handling capacity and ability to work against gravity. Mesh screen wicks are less expensive to manufacture, but allow the heat pipe or vapor chamber to be thinner relative to a sintered wick. However, because the capillary force of the screen is significantly less than a sintered wick, its ability to work against gravity or handle higher heat loads is reduced. Finally, there’s a grooved wick whose cost and performance is the lowest of the three. It should be considered only for gravity aided applications where the evaporator is below the condenser. The grooves act as an internal fin structure aiding in the evaporation and condensation. The three most common types of two-phase devices can be made into virtually any shape and form depending on application needs. The chart below summarizes the manufacturing, dimensional and cost information associated with each. Celsia produces other types of two-phase devices, which move heat via latent heat of a working fluid, including thermosyphons, loop heat pipes and pulsating heat pipes. Thermosyphon have been around for at least as long as heat pipes. They use gravity to return the liquid and may or may not have a wick in the evaporator to aid in evaporation. These low-cost devices are ideal for moving a large volume of heat to a remote location as long as it is gravity aided. Loop heat pipes can move heat over longer distances and with greater efficacy against gravity than other types of two-phase devices. They use the vapor pressure of the working fluid to move the liquid via a return line to the evaporator and are commonly used in satellites. 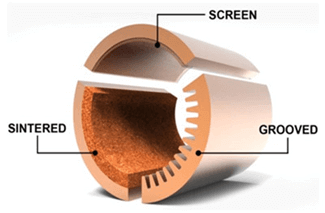 Pulsating heat pipes are devices that are wickless and highly filled with the working fluid and use the expansion and contraction of the vapor to move liquid slugs around transferring the heat. These have not achieved any real level of commercialization. For two-phase design engineers with access to the correct modeling tools and who know the effective conductivity of the devices, choosing between heat pipes and a vapor chamber is a straightforward task given they know the power and size of the heat source. For others, it’s best to start with these two simple rules, then work with Celsia to refine the selection process. For many reasons, a thermal design may require the heat source to be in a different location than the fin stack (condenser). Heat pipes often do a better job of connecting the two by virtue of their ability to be formed into any shape along all axes (X,Y, and Z). This is particularly true when compared to a two-piece vapor chamber which cannot be bent along the Z-axis. While a one-piece vapor chamber alleviates this limitation, heat pipes still have the advantage. Hot spots on a semiconductor die face or higher power densities may require heat to be spread over a large surface area, even if it’s being moved in the process. Here vapor chambers have the advantage because they both spread and move heat multi-directionally, while heat pipes (even when used together) move heat linearly. Lower power and/or lower power density applications often require only a single small heat pipe (3-6mm diameter), making them a very cost effective solution. 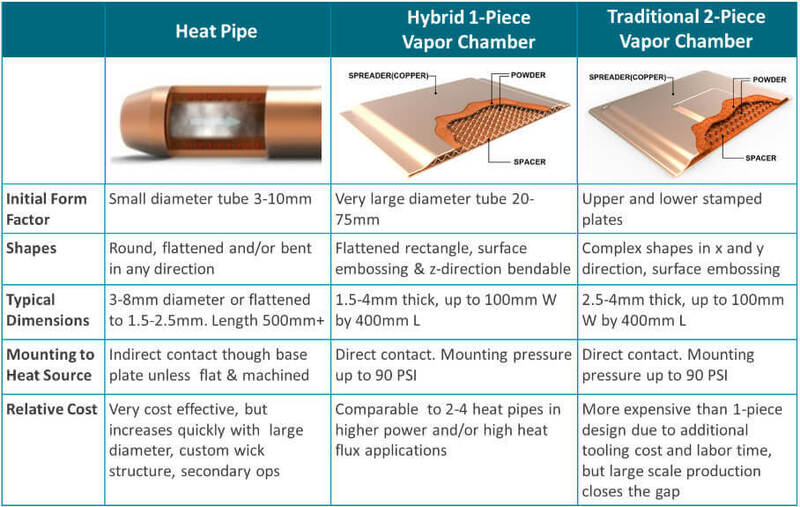 Vapor chambers, from a cost perspective, become tenable when competing against 3-4 heat pipes in a thermal solution. Vapor chambers perform better than heat pipes for many applications despite what some heat pipe manufacturers may claim. The reasons are twofold. First, because of their large flat surface, vapor chambers make direct contact with the heat source, whereas heat pipes most often use a base plate between the heat source and the heat pipes. This change in mounting reduces interface layers at the evaporator, resulting in a 3-4 °C improvement for typical electronics cooling applications. Second, another 1-2 °C improvement will occur because of reduced thermal resistances in the condenser area.